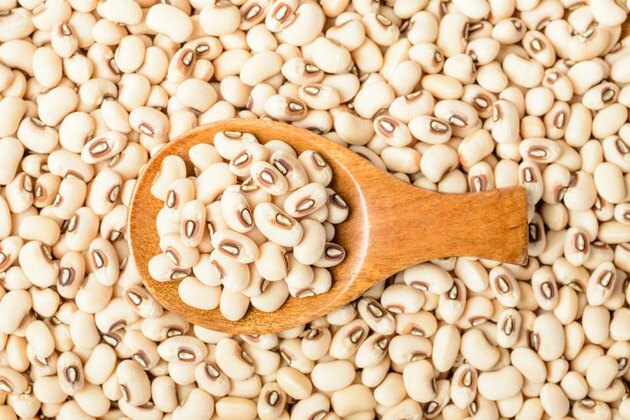 The black-eyed pea, also known as the black-eyed bean or cowpea, is a medium-sized edible bean that gets its name from the black spot found on every bean. Originating in Northern Africa, the bean is a staple food in many countries and is a part of "soul food" cooking in America, although several dishes can be made from the bean, including soups, salads, fritters and casseroles. Because black-eyed peas cook fairly quickly, they don't require pre-soaking. Rinse the beans in cold water to remove any stones and or debris that may have found their way into the beans during processing or packaging. Place the beans in a pot and cover with water, using a ratio of 4 cups of water for every cup of beans. Cover the pot with a lid. Bring the beans and water to a boil over high heat. Once the beans and water begin to boil, reduce the heat to medium or medium-low and allow the beans to simmer for one to 1 1/2 hours. When they are done, you should be able to penetrate the beans with a fork, or they should give way when you press them between your fingers. AAOOB Storable Foods: Beans -- Great Information!